I am always amazed when people say: If you do this then “anything is possible”. The “do this” can be anything to prove the point of the person making the statement and can be “eat your vegetables” or “do your homework” or whatever. Sometimes the “do this” can be substituted with “have this”, like in the saying: “If you have love, then anything is possible”. Even us engineers have a similar saying: “Given enough time and money we can do anything!”. Well, we can do anything within the laws of science, that is. You are probably asking yourself: “What does this have to do with coating processes?” As consultants our firm is frequently asked by our clients to provide them options for coating their products. To do this properly we start out evaluating “what is possible” and distill these options to “what is feasible”. Knowing how to go through these stages of evaluation is the subject of this article and also describes the service we provide these clients, dubbed a Feasibility Study. A properly prepared feasibility study should answer the following questions: What options are feasible for coating my products? How much do these options cost to purchase? What are the manpower requirements for these options? What is the cost to operate these options? How much floor space will these options require? 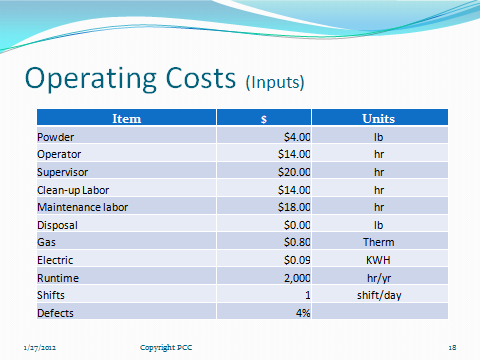 How do these operational costs compare with current finishing costs and is there an acceptable payback or return on investment? We use a spreadsheet model that we developed over the last 20+ years to determine how to best hang parts to maximize part target density on the conveyor. You can use whatever method works best for you providing that you take into account a product spacing that incorporates electrostatic wrap effects (usually 1.5 times the perpendicular dimension) and ergonomic issues that will allow proper touch-up and loading/unloading the product. The overall product window that you want to fill is most often determined by the height of the tallest part, the width of the widest part, and the length of the longest part. Using these maximum part window dimensions, fill the resultant “part cube” with smaller parts including appropriate part spacing discussed previously. Of course, you will have to calculate the hang centers of the parts based upon the pitch of the conveyor or hang points available on a load bar. Part of this model will calculate the total surface area and total mass (weight) of the products to be processed. This information is necessary for additional analyses (like calculating operational costs) and for eventually preparing a process specification to purchase the equipment. The goal here is to determine the total annual conveyor length necessary to process the volume of production parts for the target production goal, including future growth. 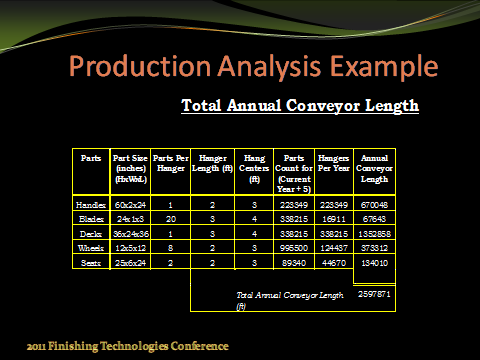 The figure below shows a simple line study calculation as part of a total production analysis. Armed with the calculated length of conveyor you must now complete your production analysis by determining estimated conveyor line speed. To do this start with the unit of time that the production volume was expressed in, such as parts per hour, parts per day, or parts per year. This total time will have to be “adjusted” to include process anomalies like recoating rejects or non productive time for color change or maintenance. 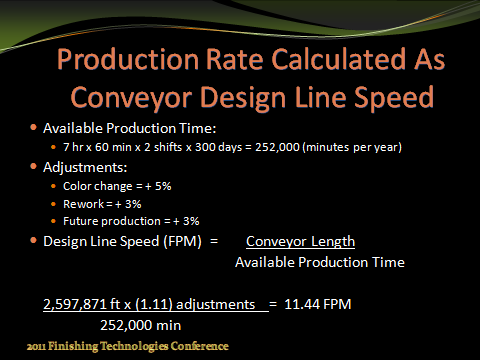 This adjusted time is expressed as an “adjustment factor” in the final line speed calculation example shown below. If the resultant line speed calculates at ≥ 6 FPM, then a continuous conveyor process is most efficient. However, if the calculation yields a line speed < 6 FPM then you need to evaluate an indexing process, batch process, or hybrid (both batch & conveyor) process. If the resultant line speed after performing the Production Analysis dictates you should evaluate a batch process, then you need to perform a Batch Analysis. 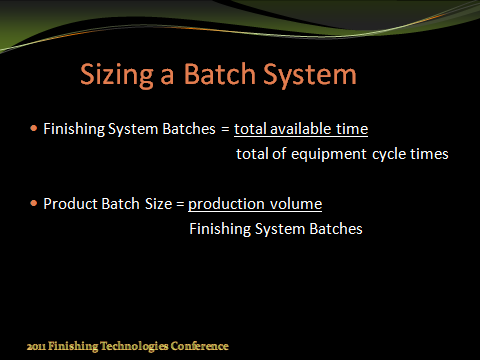 A Batch Analysis studies the effect of manpower and equipment availability to determine how much time and how many batches you can produce per unit time. Most manufacturing and industrial engineers will recognize this study as a machine loading and resource analysis whereby equipment cycle times and manpower availability combine to determine overall batch cycle time. 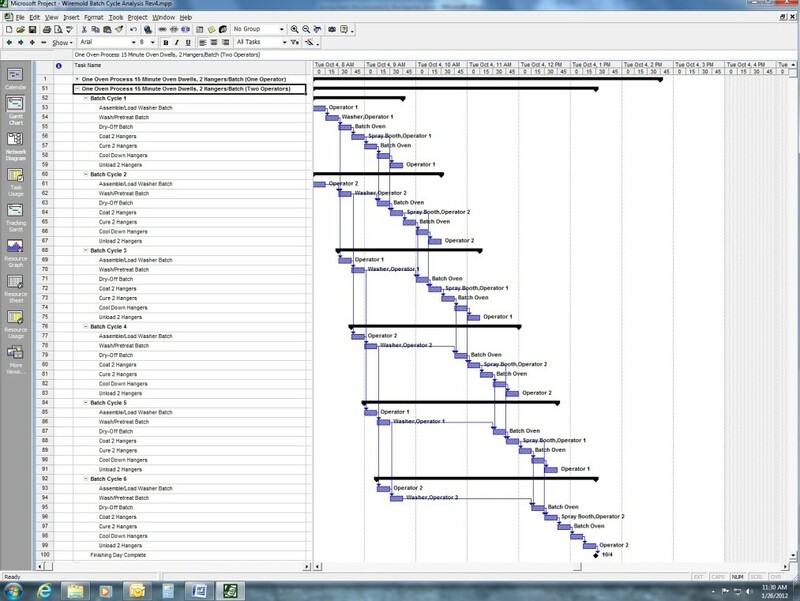 We use a Project Management Scheduling tool to perform this analysis to provide a Gant Bar Chart to determine equipment and personnel conflicts. An example of this is shown below. Each batch cycle show in the graphic above is made up or individual process steps that have their own time and manpower component. This relationship is shown below. Finally, after you resolve the manpower and equipment conflicts you will be able to determine the size of the batch equipment components by simply dividing the number of part to be produced by unit time by the number of batch cycles available to determine the number of parts per batch. Use the number of parts per batch to determine the interior cavity of the batch equipment component. This calculation is shown below. At this point of the Feasibility Study we have developed enough information to determine the coating process steps and the right-sizing information for the equipment. Now it is time to determine the manpower requirements to staff the finishing process. Batch systems are the easiest to determine staffing requirements, as it is obvious which process steps require manual intervention and the Batch Analysis shows the personnel conflicts requiring more personnel. 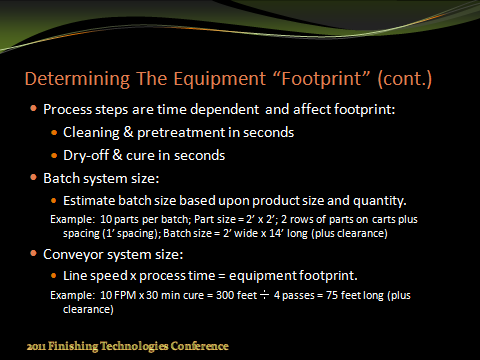 The example below shows manpower requirements comparing a batch and indexing process. 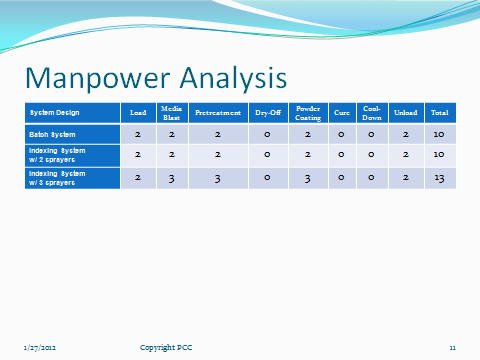 Determining manpower requirements for a conveyorized process is not as easy as a for a batch process, however. Here you need to consider the level of effort it takes to load/unload the products to be coated on/off a moving conveyor line and the level of effort it takes to perform any other manual operation, such as touch-up or manual coating operations or masking operations or manual blow-off, etc. as the process requires. You can use past experience to help with manpower assumptions or perform testing trials simulating actual production conditions and parts. All the previous analyses need to be completed before you can start with evaluating the operational costs of the finishing process(es) you are looking at. In fact, understanding the operational costs for your process options is the key to transition from “what is possible” to “what is feasible”. 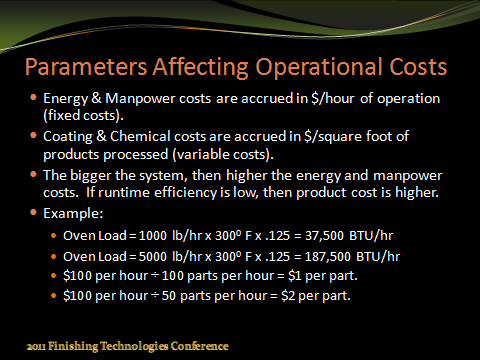 Any operational cost analysis must include labor, energy, and raw material consumption at a minimum. 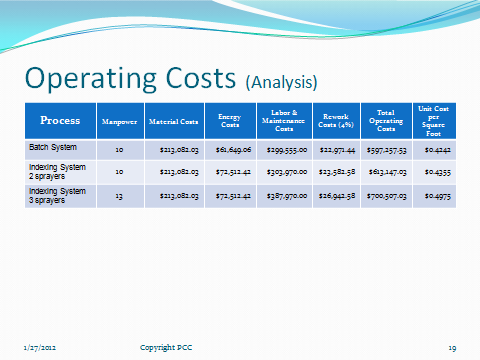 This list of cost parameters can easily be expanded to include miscellaneous costs for rework, waste/sludge disposal costs, clean-up and maintenance costs, contingency costs, and equipment depreciation costs. How much time an effort you expend in determining your operational costs will directly affect the quality and accuracy of your results. We developed a very accurate and robust operational cost estimator that provides the most comprehensive examination of total operating costs for organic finishing processes (both liquid and powder) available anywhere in our industry. This operational cost development effort is the culmination of focusing 100 man years of experience and 25 years of hands-on knowledge of organic coating operational cost estimation in support of feasibility studies. Detailed operational cost estimation must include inputs that include: part surface area, line speed, part silhouette size, conveyor weight, tooling weight, part weight, operating hours, the number of color changes, estimated defect rates, operational labor, maintenance labor, clean-up labor, supervision labor, waste/sludge disposal, maintenance parts, paint/powder costs, specific gravity for powder or percent solids for liquid values, material utilization, coating thickness, pretreatment chemicals, energy source unit costs, thermal efficiencies by energy type, electric motor sizes, compressed air consumption, setpoints for all heat related process equipment, ambient temperature, oven exhaust rates, oven radiant heat losses, EV room heat/cooling losses, flash-off losses, spray booth exhaust, solvent incineration losses, and more. 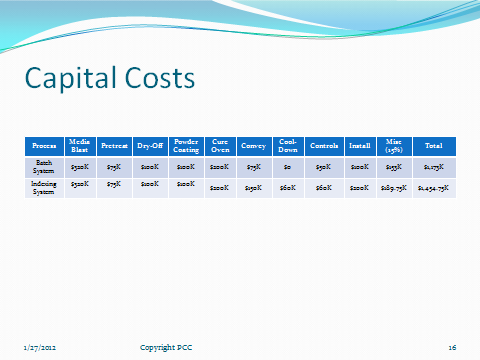 Locating the formulas to use the above mentioned inputs to calculate actual operational costs are available from a variety of resources and engineering textbooks. There are even a few “rule of thumb” estimates that can be used to simply the effort of calculating operational costs available from industry sources. Below is a summary of a detailed Operational Cost Analysis. Floor space estimation can be performed after the Production Analysis and Batch Analysis have been completed, as these provide the required information. For instance, the Production Analysis will provide the resultant conveyor line speed for conveyorized systems that, along with the time for each process step, will allow you to estimate equipment component size. Conversely, the Batch Analysis will provide the resultant batch size, along with the product dimensions, will allow you to estimate equipment component size. Below is an example of both these estimations. Once you have the individual equipment component sizes you can estimate the overall floor space required to site the entire system by sketching these in their relative positions with appropriate spacing between the components. Of course, you can always obtain a layout drawing from a willing equipment supplier, providing you give them the required process information for accuracy. Estimating capital costs can be a easy as asking for a budgetary quotation from pertinent equipment suppliers. Be sure that you provide them with the particulars from the all the previous analyses to ensure accuracy. Fortunately, we have an extensive database of past projects that we can draw from to provide estimated capital costs. Anyway, however you obtain your capital costs, be sure to include incidental costs to cover the purchase or manufacture of product fixtures or hangers, the placement of utilities, building modifications, etc. We normally, add at least 15% to the capital equipment costs to cover these miscellaneous (contingency) costs. See the example below. If the study has been properly prepared the results can be evaluated with any of these criterion. It often comes down to reducing the options and organizing/presenting the results for easy evaluation by the client. 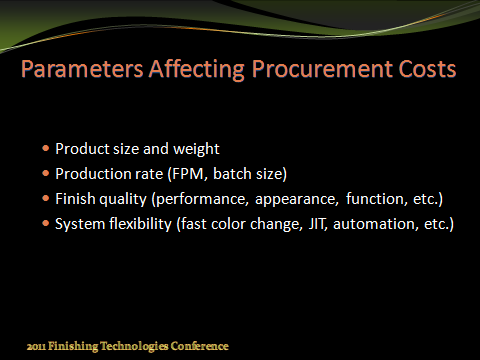 Generally, the following graphics show what issues affect capital procurement costs and what items affect operational costs. These are most often the items that are used to determine “what is feasible”. Organic finishing projects are no different than any other capital equipment projects. Understanding what options are available to attain your desired production, product quality, and coating performance goals is important to attain the best feasible options. Organic finishing systems, beyond the very basic ones, are sized and configured using standard equipment components to provide a custom solution to your specific project goals. Feasibility for particular process options may be based upon capital cost, operational costs, manpower requirements, or floor space restrictions. Without analyzing the “possible options” in these terms it is impossible to determine the “feasible options” available for your requirements. Of course, expert assistance in this endeavor will ensure that you have the accurate information to make informed decisions and avoid costly mistakes. Considering that this equipment may have a 30 year lifespan, you may be living with these mistakes for a long time. Give us a call (800-97 POWDER) or drop an email (info@powdercc.com) and we will be happy to discuss how our experience and tools can be used to mitigate risks in performing a Feasibility Study.